A symposium to celebrate the life of Bohdan Paczynski (1940-2007), Lyman Spitzer Jr. Professor of Theoretical Astrophysics at Princeton University, took place on 29-30 September 2007. Bohdan Paczynski impacted astronomy and astronomers alike with his innovative ideas, philosophies, and insight to astronomy, science and life in general. This volume has assembled thoughts, memories and scientific accomplishments influenced in one way or another by Bohdan, who was a Giant in his field. Nine friends, colleagues and admirers who have been touched by Paczynski personally, professionally, or both, contributed invited presentations. 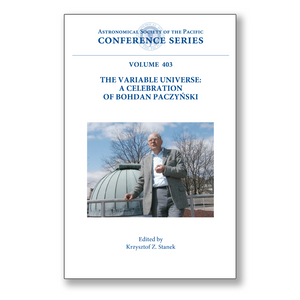 Topics in this volume include the influence of Bohdan Paczynski in the field of stellar evolution and variable stars, his crucial role in making the Optical Gravitational Lensing Experiment (OGLE) and the All Sky Automated Survey (ASAS) possible, and his revolutionary insistence on allowing anyone and everyone access to his stellar evolution code: The Paczynski Code. Also included are Bohdan's contributions to gravitational microlensing and the search for dark matter in the form of MACHOs. Particular emphasis is given to advances and unexpected discoveries from surveys such as MACHO, OGLE, and EROS. The impact Paczynski had on our understanding of gamma-ray bursts is also discussed. Finally, this celebration of Professor Bohdan Paczynski is completed with the addition of personal accounts of his life, brilliance, sense of humor, and inspiration to others. Paczynski's scientific contributions reach across all of astrophysics and bridge the gap between observation and theory. This book is of interest not only to those who knew him, but also to those who know of him and the immeasurable ways he left his mark on the community.